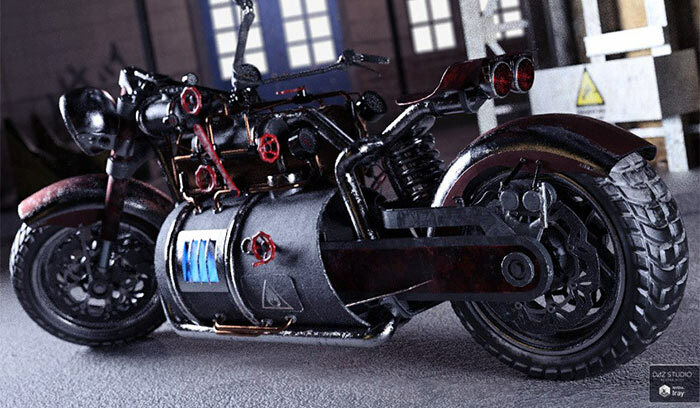 Being a huge fan of fantasy, sci-fi and steampunk vehicles and props, I just couldn’t resist checking this awesome Steampunk Motorbike out. In today’s video, I take it for a quick spin inside DAZ Studio, and mention some of its amazing features, as well as a few downsides. It loads and renders perfectly, but there’s quite a lot of textures included, so it takes a while to load them into the graphics card memory. Once loaded, it renders quickly and fully using the GPU on an Nvidia GTX 1080. It comes with two looks, head and rear lights on /off, and some other features, one of which failed to load. (Some fire effect). Also, I kind of miss having female and male poses included as it can be quite daunting to pose a figure on this bike. Another small drawback is that one of the looks features the mudguards with very “clunky” looking texture with quite a large “normal-texture” pattern. You can minimize the normal maps intensity to counter this, but it was not possible to tile the textures for a smaller pattern. It’s possible to alter the look of the bike to an alternate version, where the mudguards look much better, and also, you can remove them quickly with the click of an icon. Check out this beast on DAZ HERE. As always, comment below if you find this video useful, and share with your friends. P.S. Check out this beast on DAZ HERE.